Iain has been writing full-time for something like 15 years. No small amount of that time has been spent writing for various licensed Star Wars publications, including two huge and successful internationally published partworks projects for De Agostini. In recent years, he has been writing for the videogames industry, including stints at Midway, Ubisoft and Relentless Software. The latter saw Iain work on the very popular Blue Toad Murder Files. The whole Dark Harvest, Promethea thing has been nagging at Iain for many years now. It first popped into his head in the early 1990s as a chat between Frankenstein and the Creature on the deck of an ocean liner in the 1920s. Much later, it was to be published as an RPG sourcebook called Promethea for the late, great Silven Publishing sometime in 2005/2006. After a long discussion with the most excellent Gregor Hutton at Conflagration in Glasgow one year, Iain decided to go it alone. 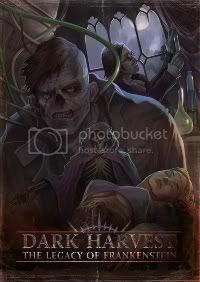 In fact, he went it alone with many of his terribly talented friends and the result is Dark Harvest: Legacy of Frankenstein. All of which just goes to show… Something. He also Twitters (as EmbraAgain) but, as with most Twitterings, can’t promise it’s in any way informative, entertaining or spelled correctly. I don’t know if you’re the right person to contact but does DH have any artist/contributor guidelines?,above is the link to my pages at Deviant hope these help if you’re interested if not many apologies and thanks for your time. Martin, your work is great. Really like it. I wish I could say I was looking for artists at the moment, but sadly that’s not the case. That said, I’ve got your details via the DA site and really will keep you in mind for the future. Promise. In the meantime, I’d encourage you to pop over to the Cubicle 7 site and drop an email to their art director. In fact, I’d encourage you to do that for any rpg company you might fancy working for. Good art will out!